Glenfall is very fortunate to have a mature area of forest in its grounds lending itself very nicely to Forest School, and is also led by a fully trained Forest School Leader. The main aim of Forest School is to offer and provide children of all age’s experiences to explore the natural world. Every area of development, including physical, cognitive, linguistic, spiritual, social and emotional will be experienced in Forest School. This allows the children to learn and develop in different ways and at different rates through practical activities to stimulate imagination, creativity and investigative skills. All children at Glenfall will experience Forest School several times during the year. Reception go to forest school weekly. Years 1-3 are timetabled for bi-weekly sessions and Y4-Y6, approximately twice a term. 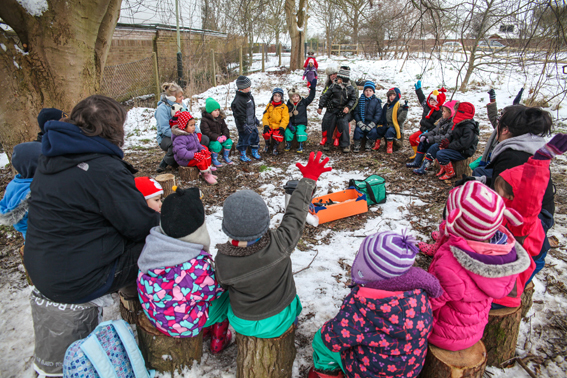 Forest school encourages children to learn from real experiences; children use the natural world to develop a love of learning and wonderment. The many different learning styles are catered for in Forest School and no-one fails. Children are encouraged to explore and take risks trough child led activities thus developing social and emotional skills and building self confidence.